With the warm weather down here in Louisiana, it does not feel like fall quite yet. But the start of school and arrival of SEC football bring fall thoughts to mind no matter the temperature outside. Now is a great time to "fluff" your front porch and/or entryway with a new wreath. I know my spring mossy wreaths are looking pitiful. 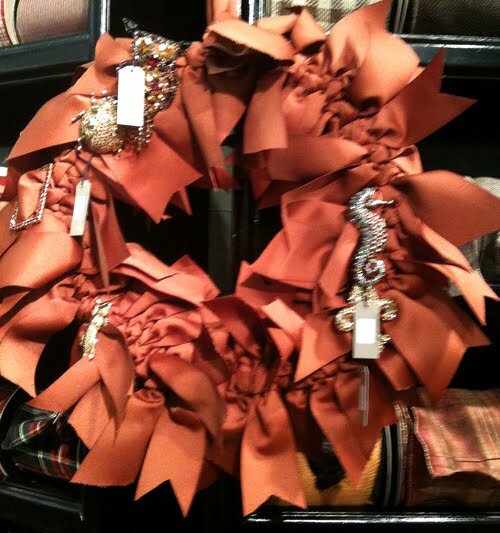 Here are a few pretty alternatives for a new fall wreath. Fall wreath with decorative mesh. I had all intentions of creating a new wreath for Halloween or fall with this decorative mesh when I stumbled upon this one online. 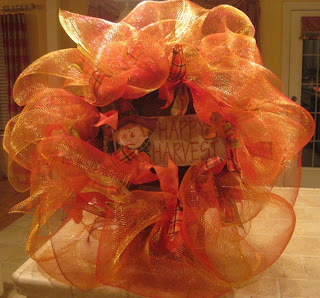 This wreath created by Kristen who writes a blog called, Kristen's Creations uses two colors of the decorative poly mesh in fall colors. I think she is using orange and a burgundy. Any combination of autumn color mesh would look good. Instead of looping the mesh around the wreath in one piece, like I did for the Mardi Gras wreath (see tutorial), she cuts 8-10 one yard pieces and ties them onto a grapevine wreath. Great idea and wreath! Shop: Deco mesh rolls, to create your own autumn color combination. New! A video tutorial on how to make a fall or halloween wreath with deco poly mesh and a work wreath form. Click here to see it. Burlap seems to be on all the blogs I love. This pretty burlap floral wreath was posted on Craftaholics Anonymous. This blog is full of creative things to do with burlap for the fall and beyond. This burlap flower wreath as created by Kim at 100 Words Photography. The detailed flowers are precious. I think the burlap's texture and the color combination are perfect for fall. How to: Sadly, I can't find a tutorial for this one yet. I may try to figure it out on my own. It is too pretty to pass up! 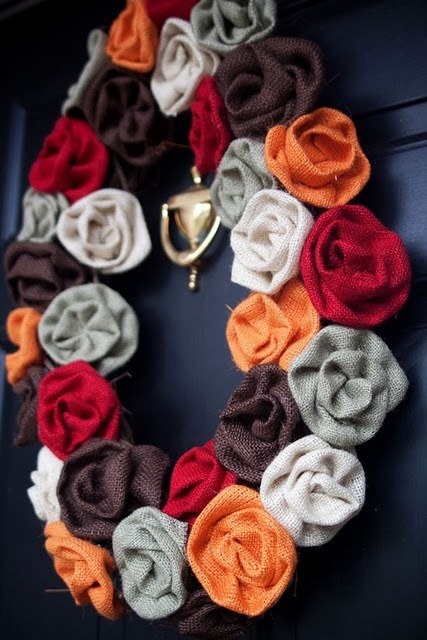 My last fall wreath inspiration is a ribbon wreath. I found this one at market this summer. This ribbon manufacturer had wonderful designs all made with their beautiful ribbon collection! I am sorry the picture is so poor. I only had the camera on my phone. This fall ribbon wreath is done in burnt orange grosgrain ribbon. The designer is creatively showcasing beautiful jeweled pins on this one. I think this elegant wreath looks amazing. How to: The wreath is made with a round wreath form, either wire or styrofoam. Pretty ribbon (grosgrain pictured) is tied all the way around- covering the wreath form. A tip: the wider the ribbon, the less yardage you will need. The ends of the ribbons are all cut in tailored V.
This wreath style can be tailored to so many seasons! I envision doing a similar style wreath with a pretty Mardi Gras ribbon.